The British School Of Manila celebrated its multiculturalism through its recent International Evening activity dubbed as “A Taste of our Cultures”. It was indeed a grand celebration, from the delicious food around the world, to students and parents' beautiful production numbers and the spectacular Parade of Nations. Hundreds of performers have been rehearsing since January to provide the guests with spectacular entertainment. It was truly amazing. The Marching Band, Majorettes and Festive Higantes were really show stoppers, making the event last February 23rd the best yet of the BSM community. 1,600 people attended the biggest fund-raising event in the Service Learning calendar, and sold over 3,700 raffle tickets hoping to reach the fund-raising target of one million Pesos. The overwhelming generosity and willingness of everyone to pitch in made it such a great night for BSM community and BSM is extremely grateful to everyone who attended International Evening . The quality and sheer variety of food at The Food Stalls was amazing. They had larger food stalls, catering for hundreds of guests, and boutique food stalls with niche products. A great combination, with something for everyone to indulge in. The lamb rolls and sausage sizzles at the Australia and New Zealand booth were a huge hit, as was the deliciously authentic Thai food, elegantly served by the Dusit Thani. The “Birthday Tea for a Queen” at the British Stall was a treat, with sandwiches, pies and sausage rolls alongside sweet bites including Victoria Sponge, Lemon Drizzle and Carrot cakes. The Japanese stall offered beautiful sushi, ramen and takoyaki with their ever popular California Rolls. And even before the Indian stall could open, families were queuing up for their veg and non-veg dishes, including chicken makhanwala, mutton keema, samosas, dhal makhani and dosas. Korea offered traditional bulgogi, pancakes, japchae, kimchi and fried chicken. China put on a feast of dumplings, pork buns, spring rolls, gyoza, ki-kiam, shrimp rolls and boba milk tea, which proved very popular with their students. Spain brought their traditional paella to the party, with a huge tapas selection, including chorizo, gambas, croquettas, tortilla and delicious sangria. The buffalo wings of the USA ran out early, as did their cookies and Hershey chocolates. Traditional German treats including bratwurst, sauerkraut, potato salad and homemade pretzels were a welcome addition, as was the bacon and cabbage, smoked salmon, cheddar, Irish coffee mousse and Irish tipples at the Irish booth. The Middle East and North Africa served up delicious dips, including hummus and zaalook with pita, France and Switzerland gave us raclette among other delicacies, Scandinavia treated us to meatballs, canapes, cake and traditional Schnapps, and even Italy was represented with a stall run by San Remo, serving pasta dishes to suit every taste. And last but by no means least, the beautifully lit Filipino booth gave a treat from every corner of the Philippines. Roasted lechon, a Lumpia bar, Inihaw bar, salmon belly, noodles, pork bbq, pancit canton, pancit ivatan, dirty ice cream, Filipino desserts as well as buko juice! The dance performances on the night truly showed the diversity, and the talents of the BSM community. From individual performers singing the Philippine and British National Anthems, dancing the Flamenco and covering Ed Sheeran; to large scale group dances, including the Indian musical medley, which spanned dances from the whole country and from the very classical to a disco-themed Bollywood number that the guests enjoyed every moment. There were also story telling of the Chinese Zodiac, a traditional German folk dance called Schuhplattler and a funky hip hop number from the primary students. The Haka was a real highlight of the evening, performed by a group of BSM students and boys from the Tuloy Foundation, as were the ballet numbers. The traditional ballet show, with dances from Russia, Spain, Hungary, Germany, America and Vienna, as well as a fantastic performance of “Swan Lake” and “Chariots of Fire” by a few of our Rugby Team were enjoyable. Pink tutus and varsity attire have never joined together to provide so much enjoyment to so many. The British Food Stall helped to bring the “British Bake Off” fun to their community event, with a competition for the best cake baked by teachers and students. A delicious chocolate cake took the crown for the adult cake and two of our Primary students shared the prize for their trifle and cupcakes. The Parade of Nations also provided the perfect opportunity to reward creativity. The costume competition gave the judges a tough task, but the 5 lucky winners this year, had beautiful outfits from their home countries of UK, Germany, Korea, South Africa and Russia. A few visitors to the event were lucky enough winners of gift certificates for stays in some of the most beautiful parts of the Philippines, including Atmosphere Hotel & Spa in Dumaguete, Dedon Island Resort in Siargao, Bamboo Private Island in Palawan, Nobu Hotel at City of Dreams, Rieseling Boracay Beach Resort, Coco Grove in Siquijor, Coco Beach in Puerto Galera, The District Boracay, Busuanga Bay Lodge in Coron and Buri Resort & Spa in Puerto Galera. 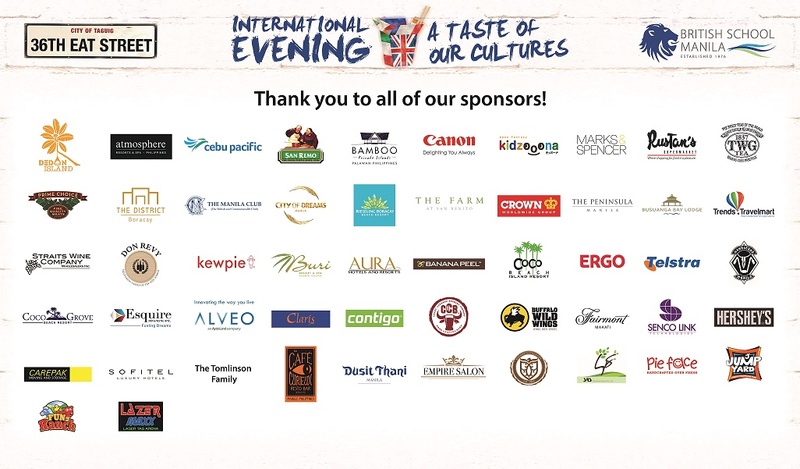 Top prizes included roundtrip flights to Guam on Cebu Pacific, an overnight package at The Farm at San Benito and free dining at Cafe Curieux, The Peninsula Hotel and Fairmont Makati accommodations were among the other amazing prizes. Of course, none of this could have happened without the truly amazing Operations staff who worked almost through the night, and the rest of the support staff, teachers, parents and students who gave their time willingly to become Bakers, Food stall helpers, Bar Staff, Raffle ticket sellers, Parade helpers, Entry ticket staff, KidZone supervisors, and help the rest of the community enjoy themselves, while raising huge sums of money for Service Learning. A few individuals took on such large roles, they were almost given staff passes. These amazing BSM parents made the Parade of Nations such an amazing spectacle; kept track of everything to do with the Food Stalls, ensured the event looked beautiful, and ran the ever-popular PTA bar. Finalay, BSM lauds the huge number of its generous sponsors, who provided money, prizes and food, and helped to make sure that as much of the money raised on the night goes straight into the Service Learning Fund, and helping the Service Partners that they work with. All of the money raised goes towards supporting BSM Service Partners. ⦁¤ The Fairplay for All Foundation, a charity working in Payatas, the largest dumpsite in the Philippines and home to half a million people. Their main projects include a drop-in centre, Payatas Football Club and the Fairplay cafe (10,000 Pesos). This year, with the fund-raising target of one million Pesos, BSM hopes to be able to make even more of a difference to the communities around with this amount. Do visit their website at www.britishschoolmanila.org or follow BSM on twitter www.twitter.com/bsm_1976 for updates.